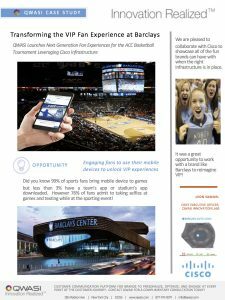 99% of sports fans bring a mobile device to games but less than 3% have a team’s app or stadium’s app downloaded? Yet 76% of fans acknowledge taking selfies at games and texting at sporting events! 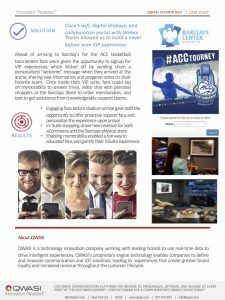 March 2018, QWASI activated basketball’s favorite NCAA tournament, the ACC Basketball Tournament featuring Duke, UNC, Boston College, Virginia Tech, Notre Dame, Wake Forest, Miami, NC State, Pittsburgh, Syracuse, UVA, Louisville, Clemson, Florida, and Georgia Tech University. “We wanted to show off the power of mobile technology when paired with the state of the art Cisco infrastructure,” Leon Samuel, QWASI CEO. 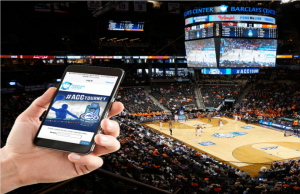 Ahead of arriving to Barclay’s for the ACC basketball tournament fans were given the opportunity to signup for VIP experiences which kicked off by sending them a personalized “welcome” message when they arrived at the arena, sharing seat information and pregame notes on their favorite team. Once inside their VIP suite, fans could tap on memorabilia to answer trivia, video chat with personal shoppers at the Barclays Store to order merchandise, and text to get assistance from knowledgeable support teams. Enabling memorabilia enabled a fun way to educated fans and gamify their inSuite experience. Cisco (NASDAQ: CSCO) is the worldwide technology leader that has been making the Internet work since 1984. The company’s people, products, and partners help society securely connect and seize tomorrow’s digital opportunity today. Discover more at newsroom.cisco.com and follow them on Twitter at @Cisco.